New imagery products available through GIBS provide stunning views of Earth at night. Night presents special challenges—as well as a wealth of opportunities—to users of remote sensing imagery. From tracking severe nighttime storms using pinpricks of lightning flashes to monitoring ice concentrations through the reflection of moonlight off frozen ocean surfaces, remotely sensed imagery of Earth at night literally open an entire new world of observations. Now, near real-time imagery available through NASA’s Global Imagery Browse Services (GIBS) provide a stunningly clear view of our nighttime world. 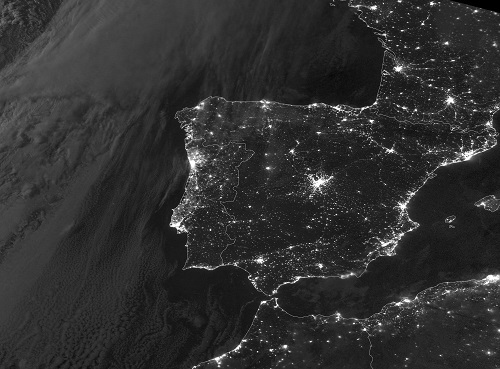 DNB image of Spain showing lights in urban centers and clouds over the Atlantic Ocean. Image courtesy of NASA's Direct Readout Laboratory. These imagery products are from the Visible Infrared Imaging Radiometer Suite (VIIRS) nighttime sensor (also called the Day/Night Band, or DNB), and are available generally within three hours of an overflight of the joint NASA/NOAA Suomi National Polar-orbiting Partnership (Suomi-NPP) satellite. The VIIRS DNB layer is created using a sensing technique designed to capture low-light emissions under varying illumination conditions, and is displayed as a gray-scale image. DNB imagery products in GIBS are available from 11 November 2016 to present and can be viewed using NASA’s Worldview or similar GIBS clients. DNB imagery have a wide range of applications for a broad spectrum of data users. Along with their primary purpose of supporting the short-term weather prediction and disaster response communities, they also have numerous socioeconomic uses, such as analyzing changes in population density using nighttime lights or spotting power outages in the absence of lights in known urban areas. A number of sources contribute to the DNB signal, including city lights, lightning, fishing fleet navigation lights, gas flares, lava flows, and even auroras. When partial to full illumination from the moon is available, reflection of this lunar illumination off of ice, snow, and other highly reflective surfaces enable the study of ocean and terrestrial features. DNB imagery products are produced by NASA’s Direct Readout Laboratory (DRL), which provides direct broadcast of real-time satellite data to ground stations. DNB imagery products are intended for use in near real-time applications, such as monitoring, managing, and analyzing on-going natural hazards or events. As a result, these products do not have a VIIRS standard data product equivalent and are not intended for use in scientific research. Starting later this year, daily VIIRS nighttime lights products produced by the Suomi-NPP Land Science Investigator-led Processing System (Land SIPS) that are corrected for clouds, lunar reflectance, and other instrument-related artifacts will become available through NASA’s Land, Atmosphere Near real-time Capability for EOS (LANCE) system. Due to their more extensive processing (at least 24 hours), these nighttime lights products will provide a more balanced view of land and ocean, and highlight features that may be missed in the DNB near real-time products. VIIRS is one of five instruments aboard the Suomi-NPP satellite, which was launched in October 2011. VIIRS is a scanning radiometer that collects visible and infrared imagery and radiometric measurements of the land, atmosphere, cryosphere, and oceans. VIIRS data are used to measure cloud and aerosol properties, ocean color, sea and land surface temperature, ice motion and temperature, fires, and Earth’s albedo.